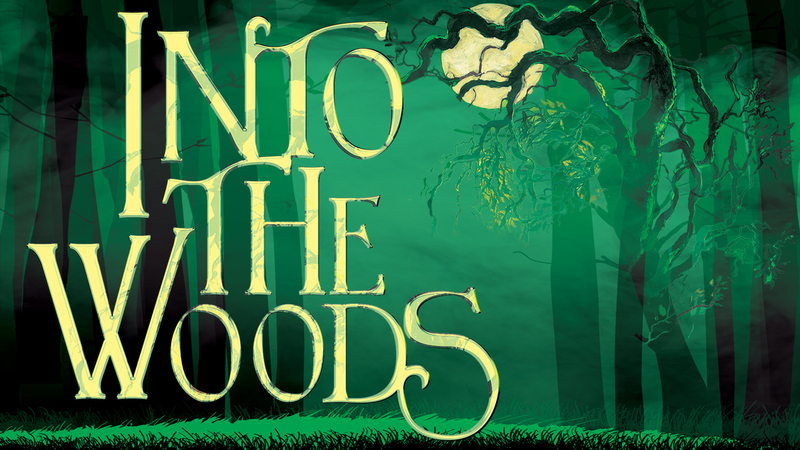 The Brothers Grimm hit the stage with a little help from Stephen Sondheim in Into the Woods, an epic fairytale about wishes, family and the choices we make. The story follows a Baker and his wife, who wish to have a child; Cinderella, who wishes to attend the King’s Festival; and Jack, who wishes his cow would give milk. When the Baker and his wife learn that they cannot have a child because of a Witch’s curse, the two set off on a journey to break the curse. Everyone’s wish is granted, but the consequences of their actions return to haunt them later with disastrous results. NY4P is coming back to your borough to find out how we can improve NYC parks! Last year at our annual Boro x Boro meeting we focused on ideas to improve local parks. This year we are focusing on action! We want to know what steps you take to make positive changes for open space, and even share a few new ones of our own. Come spend time with the NY4P staff, get to know other park organizers from your borough, and together let’s build momentum for better open space in NYC! Light refreshments will be provided. All meetings take place from 6:30pm to 8:30pm with check-in from 6-6:30pm. Se habla Español. Visit Snug Harbor to pick up your FREE rain barrel, courtesy of the NYC Department of Environmental Protection. The DEP is giving away 100 brand new rain barrels by the red barn on the southeast corner of campus near the Heritage Farm–first come, first served. DEP’s Rain Barrel Giveaway Program is part of New York City’s Green Infrastructure Plan that aims to capture stormwater before it can ever enter the sewer system and thereby reduce combined sewer overflows into local waterways. DEP has committed to invest $2.4 billion in green infrastructure projects as well as other source controls, such as rain barrels, to significantly reduce combined sewer overflows by 2030. “Richmond County Orchestra at the Movies” features popular songs from movies including music by John Williams used in Star Wars, Harry Potter, Raiders of the Lost Ark, Jaws, Superman, and more. Featured performances include the Brighton Heights Reformed Church Youth Orchestra, a world premiere by composer Gregory Houston, and movie favorites Somewhere over the Rainbow and Let It Go performed by Alison Madill. The evening features Staten Island resident Gregory Houston, whose piece (inspired by the film Ester) will be performed by the RCO as a world premiere. Mr. Houston is a freelance musician with ten years experience as a composer, conductor, arranger and pianist. 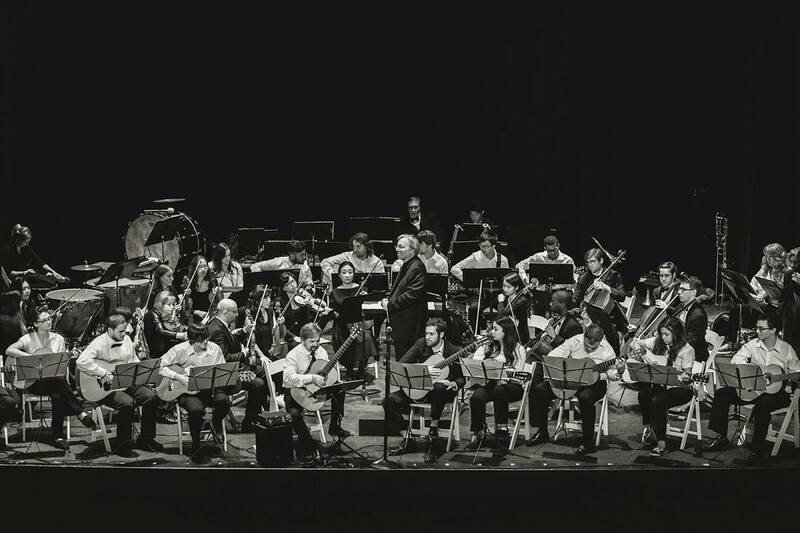 His music has been performed and read by numerous ensembles such as the WetInk, Da-Capo Chamber Players, Brooklyn College Ensemble and the Russian National Orchestra. In 2016 his chamber music was presented at the Alion Baltic International Music Festival in Tallinn Estonia. He is Assistant Conductor for Trilogy Opera Company where in January of 2014, he conducted the World Premiere of the opera “A Bird That Wants To Fly” by Micheal Raphael in Newark, New Jersey. The Brighton Heights Reformed Church Youth Orchestra is comprised of students ages 4 to 17 who perform at church and community events. Alison Madill received an undergraduate degree in music from West Virginia University as well as a masters in music from Bowling Green State University. She has performed as a young artist with the Toledo Opera and was a featured performed with The Huron Playhouse and Emerald Island Repertory Theater. She has sung with the Charleston Symphony Orchestra as well as the Wheeling Symphony Orchestra. She has studied at the Austrian- American Mozart Academy in Salzberg Austria where she performed such roles as Die Konigan Der Nacht from die Zauberflute and Valencienne from Die Lustige Witwe. She is currently splits her time between raising her family, working on Wall Street and working as the creative arts assistant for the Church at the Gateway in Staten Island. Soprano Cheryl Warfield has performed over 15 lead roles in the standard operatic repertoire during her career, including the title roles of Tosca, Aida and La Gioconda. An outstanding arts administrator and creator/ producer of innovative vocal arts programs, Cheryl is a founding member and producer for Amore Opera in Manhattan and artistic director of the Manhattan Opera Repertory Ensemble (MORE Opera), where she has produced concert performances of Verdi’s “Ernani,” “Il trovatore,” and “Aida,” and Puccini’s “Tosca,” conducted by Anton Coppola. She founded ADVANCE, a not-for-profit vocal arts organization that produces concerts of classical music, including the spirituals concert, “Paul Robeson: A Celebration of Culture,” and the one-woman musical “Meet Dorothy Maynor,” about the life and career of the Harlem School of the Arts founder. 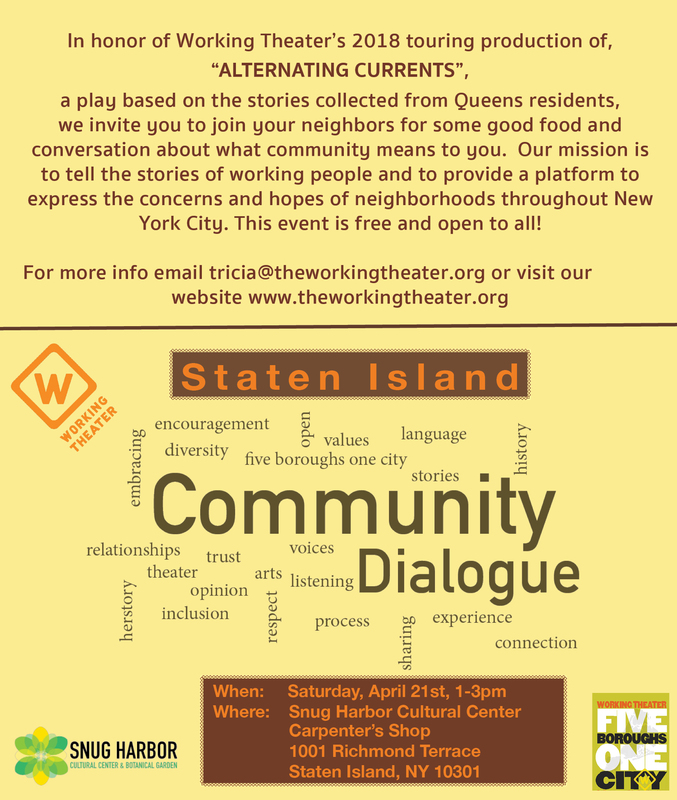 In honor of Working Theater’s 2018 touring production of “Alternating Currents,” a play based on the stories collected from Queens residents, we invite you to join your neighbors for some good food and conversation about what community means to you. Our mission is to tell the stories of working people and to provide a platform to express the concerns and hopes of neighborhoods throughout New York City. This event is free and open to all! For more info, email Tricia@theworkingtheater.org or visit our website www.theworkingtheater.org.